So you want to copy SharePoint files from your computer to a SharePoint library, and are wondering what your options are? Well, you're in luck because SharePoint already offers two - the Multiple Upload function, and the Windows Explorer view. The Explorer View is one way of transferring your files from your computer to a SharePoint library, and functions the same way as if as if you were moving files from one folder to another in your file share system. This function, however, is extremely slow, and doesn't allow you to predefine a set of metadata on the files you are moving. If your content type in SharePoint has a required field, all your documents will be checked out under your name. Which means you'll need to edit every document, one by one, to set the missing properties. For massive file uploads, seeing a "not responding" window is not a rare occasion when employing this method. The Multiple Upload function is, by far, the one that I prefer. You can upload your files by selecting them from your computer, and you can monitor their status as they are uploaded. Unfortunately, however, you can't copy more than 100 files at a time, and you can't copy a folder as a single item. If you want to bulk copy files in a folder structure, you need to, first, recreate your folder structure in SharePoint, and then copy your folder content one by one. Additionally, there doesn't seem to be a way of easily managing the properties of documents once they are uploaded. 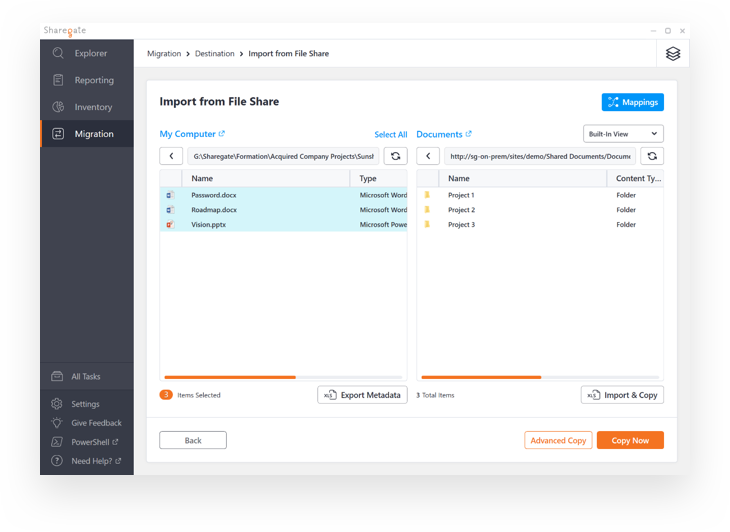 Sharegate's File Migration Functionalities to the Rescue! Thanks to Sharegate's SharePoint migration capacity, you now have a third option! With Sharegate, you can simply browse the contents of your computer, and conveniently copy files or folders to a SharePoint library. Additionally, as you copy your files, you can also define a Property Template that will automatically set all your metadata to your files. 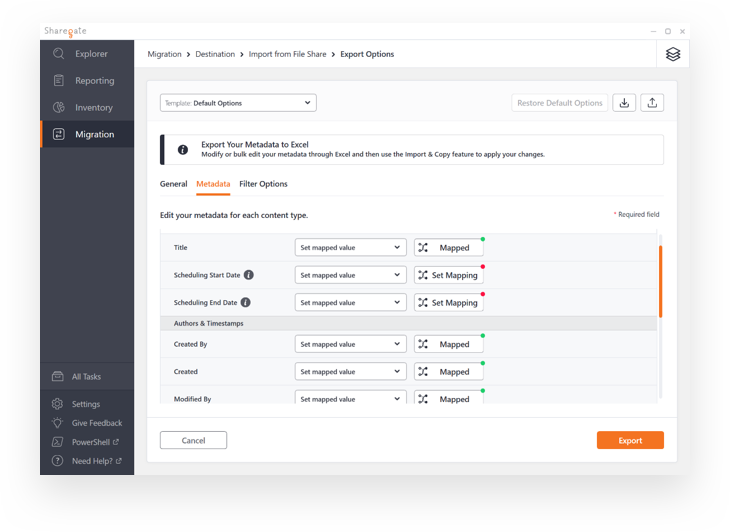 Furthermore, there's virtually no limit to how much you can migrate over: You'll be able to copy more than 10,000 files at once, without experiencing any problems. Sharegate will conveniently display all your file share folders in one place, enabling you to easily locate what you're looking for, and prepare it for bulk copying into SharePoint. 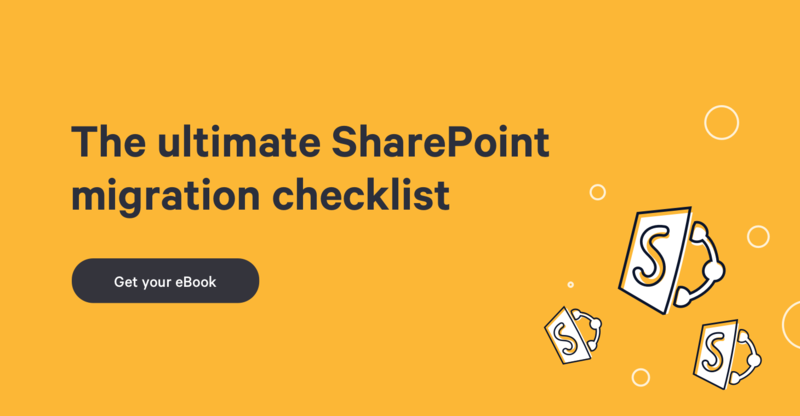 Once you've selected the files to be copied to SharePoint, you can easily define the properties you'd like to carry over. This eliminates the tedious work of having to modify each document after it's been copied. Once you've defined all your properties, you can simply click "Copy". 3) Just Damn Simple! All your documents are now in SharePoint, with their metadata preserved! Otherwise, you can give our tool a try here.